Do you remember the credit crunch and the Great Recession that came in its wake? It's a question worth asking because many Americans seem not to. They appear to have forgotten the pain, fear and stress of unmanageable debt, and are borrowing again at unprecedented levels. True, credit card debt is still well down from its trillion-dollar high, but it's rising: In September it stood at $881.8 billion, according to the Federal Reserve, up $30-plus billion on the same month last year. But the really scary numbers concern "non-revolving" credit, which comprises installment loans with monthly payments and fixed end dates, such as student, auto and personal loans. So just how bad are those figures for non-revolving credit? To put them in context, let's consult the Fed's archives. About 10 years ago, in September 2004, the balances outstanding for these sorts of loans totaled $1.4 trillion. They first topped $2 trillion in August 2012. In September 2014, they stood at $2.4 trillion. Add in that $880 billion in revolving debt, and you're looking at over $3.2 trillion: $3,246,848,000,000 for those who like to be precise. That's about $10,000 for every man, woman and child in the country -- including the tens of millions who aren't creditworthy enough to borrow more than a few hundred dollars from payday lenders, and the other tens of millions who are free of these sorts of debt. And that figure doesn't include mortgages. Those add another $13.3 trillion to the total. It's not hard to find those who take a black-and-white view of borrowing: debt bad; debt-free good. But nowadays most people acknowledge that mortgages and student loans are usually good: they're investments in a person's future. Borrowing on credit cards, on the other hand, is to many -- including some experts -- always bad. And yet it's easy to find examples of "good" borrowing on plastic. Say you need your car to get to work, and it breaks down. If you've no choice, is it wrong to put the cost on your credit card, and pay it down over a few months? Or suppose you've been unemployed for a while, and need some smart clothes for a promising interview scheduled for Monday. Both of those are investments in a person's future, just like mortgages and student debt. Surely, you'd need both to lack empathy and to live in a rarefied world in which multi-thousand dollar emergency funds are commonplace to condemn that sort of borrowing. Indeed, many can see little wrong with occasionally or even often using credit cards to smooth out household cash flow, providing balances are relatively low, and payments are easily made. Yes, there are cheaper ways to borrow, but some involve putting your home on the line, and others require masses of time and paperwork to set up. And, yes, it's much better just to save up and buy the thing you want when you've built up enough cash. But the cost and harm of using a card to borrow modestly and occasionally are small. In fact, if you use plastic that offers an introductory zero-percent APR on purchases, you might even come out ahead of where you'd be were you to have saved up. Debt on plastic becomes an issue when it's used to prop up a lifestyle that's unaffordable and unsustainable. It's then that balances start to snowball and interest payments start to balloon. And it's then that feelings of helplessness and hopelessness start to take hold. There are almost always ways forward, as described in "6 steps to wipe out your credit card debt." But they take grit, determination and perseverance. Most might prefer to avoid the whole mess in the first place. You might think that subprime borrowers (defined by the U.S. Treasury as having a FICO score below 620) are the last people who should be offered credit cards. True, some of them may still be building their credit scores from scratch, while others may have been through tough financial times for which they were blameless. But a whole lot are going to have iffy pasts that include a proven record of mismanaging plastic. So to whom do you think credit card companies are currently issuing cards at the most accelerated rate? Yep: subprime borrowers. A report published by Equifax on Nov. 9 reveals that 9.84 million cards, with combined credit limits of $12.68 billion, were issued to people in this group during the year ending July. That's a 43.5 percent increase on the number issued to them during the previous 12 months, and a six-year high. The increase across all card applicants was roughly half that. Of course, many of those with low credit scores receiving these cards are going be responsible and competent money managers. But many more are likely not to be. With honorable exceptions, people tend to have poor scores for a good (or, rather, bad) reason. 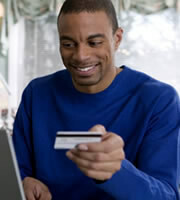 IndexCreditCards.com often encourages readers to use their credit cards. No apologies for that: they simply are the best way to pay, though only occasionally to borrow. But that's always hedged with a warning to those who can't handle plastic well. A card provides a constant flow of temptations, and those who can't resist would be doing themselves a favor if they avoid plastic. Those who can resist would be cutting off their noses to spite their faces by doing the same thing. 0 Responses to "Don't forget the misery of debt"